Start Using Service Forecasting in your Service Marketing. Pentana Solutions has recently been working on changes to the way ‘service marketing’ is structured in DealerSocket. Up until recently, service marketing business rules were structured in such a way that they would use either the close date of the most recent “01” opcode service or the weeks since a vehicle had an RO closed against it. We have been working tirelessly to integrate ERAnet’s service forecasting functionality for use in service marketing within DealerSocket. We have integrated functionality for Service Followup Days in Dealersocket, so when an ERAnet user closes an RO they will be prompted for the date that vehicle is due for its next service. They can either choose to use the default date or enter one of their own. When the RO is closed - this date will be passed to Dealersocket as the “NextServiceDate”. The code changes required to use Service Followup Days with Dealersocket are contained within GU4. How will it improve on the existing Business Rules? The use of service forecasting greatly reduces the complexity of the DealerSocket business rules. Since a single date is being used as selection criteria, users can still customise business rules to target specific makes or models of vehicles. However, most importantly it allows users full control over which date is chosen for the next scheduled service for a customer’s vehicle now that the Service Followup Date is passed to DealerSocket. Sounds good, how do I begin using service forecasting in DealerSocket? There are 2 items to check before you’ll be able to use service forecasting in DealerSocket. 1. Check that your ERAnet server has either GU4 or the 9:176 patch installed - these updates contain the code changes necessary to send the service followup date in RO Close and Appointment updates sent to DealerSocket. 2. The followup days for each opcode needs to be setup in 3605 - the number of days entered here will be used to calculate the new service followup date when closing an RO. Once the 2 items above have been confirmed, the service followup date (where entered) will be sent for each closed RO and Appointment which is entered in a valid ERAnet store. 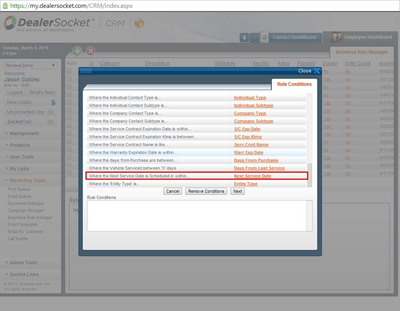 You can then access this date for use in DealerSocket’s business rules using the criteria “Where the Next Service Date is Scheduled within…..” criteria which is available for Vehicle business rules. Note: If you do not currently use service followup date in ERAnet on your site then it may not be possible to start using service followup date business rules immediately as no vehicle would have a service followup date stored against it.